Social network Twitter has always been a great way to follow and connect with celebrities, friends, family and complete strangers who share your interests. Now, it’s a great way to save money, too. Yesterday, the company launched Twitter Offers, a way to earn cash back by shopping at local stores and restaurants. Once you add an offer to your payment card, its number will be encrypted and securely stored on Twitter’s servers. That way, you’ll be able to easily add future offers to the card with a single click. Or, if you’re worried about the security of your personal data, you can choose to have Twitter forget your card info after redeeming an offer. Twitter Offers is currently being rolled out to a small number of desktop and mobile users in the United States. The company says its working with “a handful of brands to begin testing this new feature during the holidays.” No word yet on who those brands are, but you can expect them to take advantage of Twitter’s location-based GPS targeting capabilities. So the next time you walk by a Starbucks, Twitter may push an offer for a cash-back discount on a coffee or sandwich – very cool. 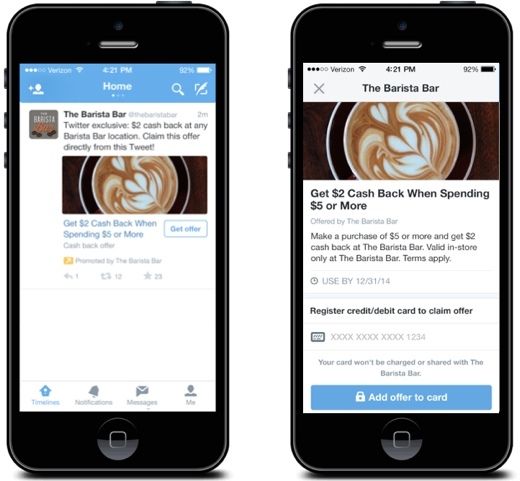 To learn more about Twitter Offers, you can read the introductory post on the Twitter Advertising Blog. For more on Twitter-based product updates and deals, follow @TwitterCommerce on the social network.